Bring some simple Scandi style home with the modern, slim legged Jensen range. 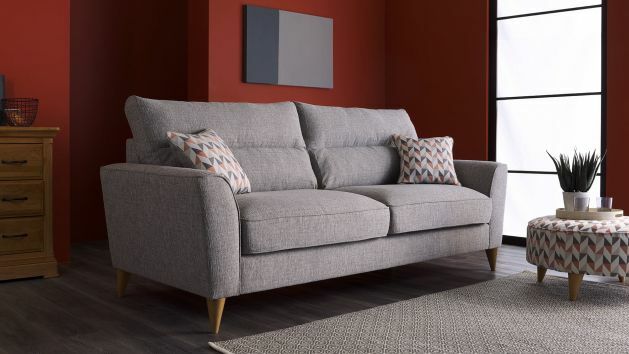 The Jensen sofa range is a modern, clean design, raised from the floor by slim, tapered oak legs. They reveal the Scandi influence at work in Jensen’s look. It’s also found in the multi tones of colour in the hard-wearing woven fabric, warm and tactile. But comfort hasn’t been forgotten at the expense of style. Back cushions have a simple horizontal stitch, ensuring the luxurious fibre filling gives plenty of support for head and back. The arms are also neatly padded, and the deep seat cushions are foam filled for support and shape retention. A simple geometric pattern is used as a fresh accent to the range, seen in the scatter cushions, accent chair and round footstool. Choose from a coral shade, or rich lemon zest to go with the three colours of main upholstery. The whole Jensen range comprises sofas to seat four, three or two, and an armchair. Together with the accent chair and round footstool, it’s a great way to bring some simple Scandi style home.